So this is one of those posts where people might get upset. I still love you. Remember we don’t have to always agree to be friends. I love pretend. I love making up stories. I just for some reason can’t get behind the Elf On The Shelf. I don’t know. 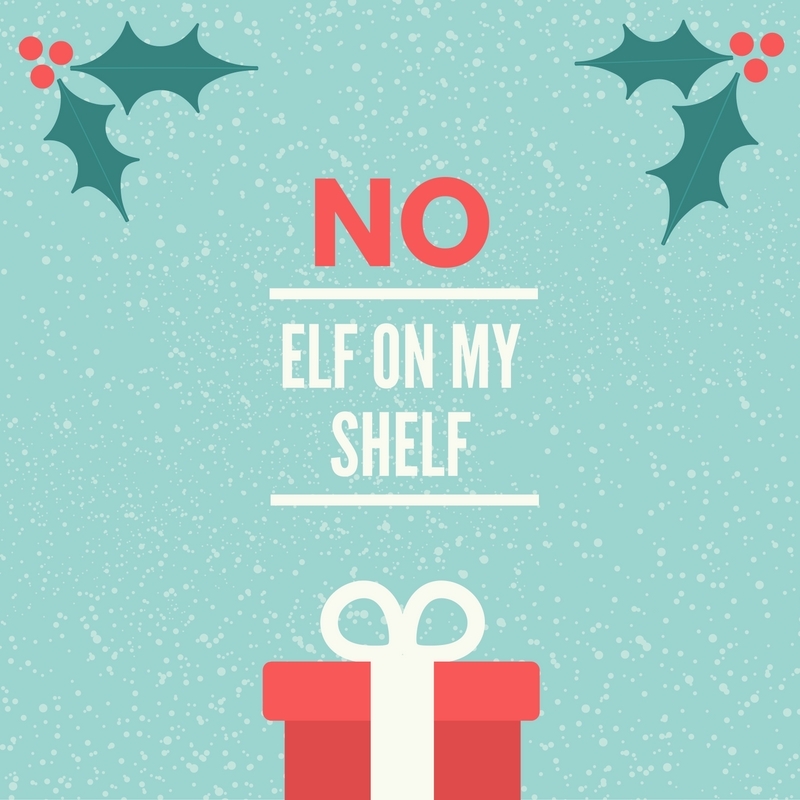 There’s a few reasons why I can’t jump on the elf’s sleigh. Don’t get me wrong I enjoy watching other families elf shenanigans, I just don’t want them in my home. I think the first reason I can’t get behind the elf is because he’s used as a behavior tool. If the only way to get your child to listen is to have a toy as a baby sitter then let’s think about what the real conflict is here. Our children should be more concerned about listening to us than what an elf is going to tell Santa. The second reason I can’t get behind the elf is that little guy is a hypocrite! Yup, I said it. He’s supposed to be in town to make sure your child behaves but what does he do? The elf creates havoc nightly when everyone goes to bed. As if taking care of a household isn’t hard enough now parents have to be concerned with the antics of an elf! Third reason if you must know is the elf kind of scares me. I know it’s supposed to be all fun and games but there’s something about that elf that looks like if you forget to move him he might move himself. You can’t tell me that the elf doesn’t look like his head might start spinning at any given moment. Just me? Seriously though if you have an elf on the shelf more power to you. Chances are I’m following you on social media and loving what you come up with for you nightly elf antics. If I’m not please tag me in your photos. I just can’t do it. I do however love the spirit in which the elf comes. He visits not only to keep an eye on things but to bring some Christmas magic into the homes he visits. I’m all about Christmas magic. As I’ve shared this is the first year that JustaBXgirl believes in Santa and the whole North Pole. In fact when we went to visit Santa she asked why we couldn’t visit Mrs. Claus too. I told her that of course Mrs. Claus was busy taking care of things back at the North Pole. It got me thinking though. How could I bring Mrs. Claus to JustaBXgirl? I decided the simplest way would be through a letter. Since Santa only brings one gift to JustaBXgirl her letter from Mrs. Claus will be attached to it. Or maybe it will be delivered in the mail? I haven’t quite decided that part yet. I think she might be more excited to have it delivered in the mail. Either way Mrs. Claus wrote JustaBXgirl a very nice letter. I think that JustaBXgirl will get a kick out of Santa and Mrs. Claus knowing about her dance show. Mrs. Claus also explained why they didn’t get her anything off of her rather extensive Christmas list. I was able to find some really nice stationary simply by Googling “Santa Stationary.” And if you’re willing to pay for it there are places you can order these types of letters. Me? I’d rather save my money on things I can do myself. I wanted to package it in a nice way. I have these random coin envelopes that I ordered a while back by mistake. I knew they would come in handy at some point. I folded the letter very small and placed in the envelope and wrote JustaBXgirl’s name in glitter pen. Here’s to hoping that JustaBXgirl doesn’t think it’s anything more than a coincidence that Santa and Mrs. Claus need to change their ink too! How are some of the ways you bring Christmas Magic into your home? I was against the elf on the shelf, too that was until I got one. It’s actually fun. I can’t say I use it as a tool to keep my daughter’s behavior in-check because she doesn’t care about that. She gets reprimanded regardless. We just like seeing her wake up in the morning (earlier than expected) to look for this elf. And again, it’s fun.